Many of the jokes in the series stem from Shin-chan's occasionally weird, unnatural and inappropriate use of language, as well as from his inappropriate behavior. A typical gag involves Shin-chan confounding his parents by using the wrong phrase for the occasion; for example, saying "Welcome back!" instead of "I am back!" when he comes home. 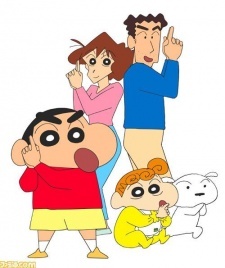 During the beginning of the series, the TV show was mostly based on the storyline in the original manga. As the show progressed, more and more episodes became anime-original.